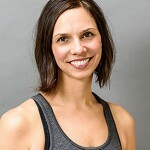 The change of seasons is a great time to reflect and reconnect with ourselves and values.Yoga instructor Lee Carson shares her tip for setting priorities and keeping stress at bay when time gets tight. “With two weeks of summer left and nothing on the calendar, I feel a little like a mother squirrel stock piling for the winter. I’m making extra batches of our homemade whole wheat chocolate chip banana bread. I tried out a new double chocolate zuchinni muffin recipe and now feel compelled to make 6 batches to have on hand in the freezer. I’m replenishing our ‘regular’ always-on-hand items in the refrigerator that I’ve let slide over the summer. Max’s peanut butter chocolate cookies (protein and calorie punch 1,2) and homemade granola bars. As the mom of two young kids in school, my life and schedule has an ebb and flow with the seasons. Seven years in, I’m finally cool with embracing the flow rather than fight against it. When the routine changes up, it’s a great time to re-connect with efficiencies, goals and most importantly, values. I think about my family’s food a lot. Clearly. One of our family values is eating whole foods that are minimally processed. The trade-off for making that happen is an investment of time prepping and keeping lists. I feel this investment is worth it for our health. But there’s more to life than food. Relating all my personal choices and time expenditures back to what’s important to me has significantly reduced my personal stress and anxiety. Aside from storing baked goods in my freezer like a squirrel stores nuts in a tree, I’ve been thinking about the shift in my workout routine. Because having a healthy body is one of my key personal values, I’m working out the puzzle in my head of what each day of the week looks like and what my workout options are for that day. I’m also making a commitment so I stick with it. Monday is the Hour of Power workout at the studio. Tuesday, I’ll swim while Gigi takes her lesson, etc. Whether or not your schedule shifts in September, it’s a great time to reconnect with your values, or define them for the first time on paper. It can be a great tool for why we do or don’t make time and energy for certain activities when commitments get tight. Our bodies are incredibly efficient. If there are joints, muscles and functions that we don’t use, our body stops maintaining those areas, putting attention to what we do use. Yoga is a powerful way to keep our joints moving, our muscles at their proper length and fresh, oxygenated, nutrient-rich blood moving throughout our system. These aspects make yoga a tonic of youth.